Snapchat’s Discover feature feels like the awkward guy in a nice suit at a casual party. Discover’s professionally made content from CNN, Comedy Central, Food Network, and others is too polished to be naturally bolted onto the app. But Snapchat’s not giving up on Discover despite reports that viewership is down 30 percent to 50 percent since its launch in January. Today Snapchat is rolling out an update that lets you send clips from Discover to friends. By tapping and holding on a Discover photo or video snap, users can add their own drawing and text embellishments and send them privately to friends. Those Snaps will include a “Sent via Discover” banner that users can click to jump straight into Discover. Snapchat announced the update in its own Snapchannel in Discover, which was spotted by Joshua Lee; the app updates that allow Discover messaging should be available for iOS and Android soon. The news comes a day after another effort was announced to intertwine Snapchat’s different products. Yesterday Snapchat began letting users download vector versions of their QR Snapcodes that others can scan to instantly follow them. One Discover partner told The Information that its daily views had fallen from 1 million to 700,000 and were trending downwards. That means just a tiny fraction of Snapchat users (some believe there may be over 100 million) visit Discover. While some dip in attention is to be expected, something needs to happen to get Discover growing. Snapchat is still trying to find a solid revenue model after ditching its initial Brand Stories ad unit that let businesses show an ad snap to people who don’t follow them. That format may have felt too intrusive, and they certainly seem less natural than the sponsorships inside Discover and Our Stories. Discover messaging could remind more users that the wall of pro content exists a few swipes over in the app. It also shows Snapchat’s potential to move past the camera and use its annotation tools to mark up other content. You can imagine how users might enjoy watching premium video content, throwing their own drawings and emojis over the top, and sharing them with their pals. 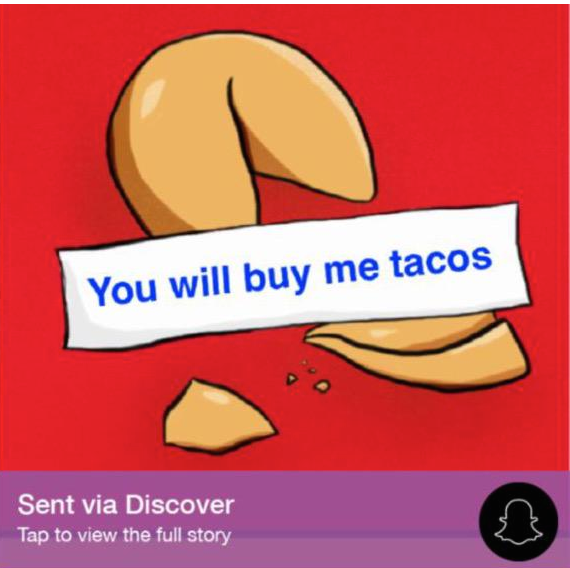 Snapchat even previewed how Discover messaging could be used to stimulate engagement and make money. Its Snapchannel asked people to caption a photo of Burger King’s mascot with Justin Bieber at the Mayweather-Pacquiao fight, and an ‘I Owe You’ note that mentions Netflix. This kind of interactivity and the deeplinking of Snaps to Discover could be the start an age where you don’t just watch or create on Snapchat, but you do things too. Overlaid banners like the one that leads to Discover could also initiate purchases or cause you to follow people. Until now, Snapchat has been about capturing and commenting on the real world. But now it’s letting us bring the same storytelling tools to digital content.